What Makes a Good Scrubber? House cleaning is what we do, and It may seem strange to some, but when I’m cleaning a home that has scummy build-up in a bath tub, a tiny part of me gets excited. It’s because I know, that when I’m finished, that tub is going to shine “like the top of the Chrysler Building” (for all you Annie fans). There is satisfaction in seeing the transformation from grimy to immaculate. Nothing helps scrubbing off scum like a good dry soft scrub, and this is where baking soda once again comes to the rescue. When you’re cleaning out the tub, simply spray your liquid cleaner of choice (we prefer green products!) 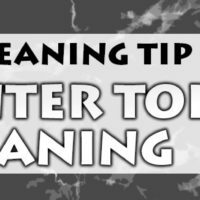 on the bottom and walls of your tub, then sprinkle baking soda (or a mixture of salt and baking soda) on the bottom of the tub. Just sprinkle for about five seconds, if you put too much on, it’ll make a paste which is counter-productive. Then, grab your scrub brush and scrub away! The “grit” from the baking soda really helps grab the bath-tub build up and cuts down on labor for you. Just make sure to rinse it all down. If you don’t have a detachable shower head, a rinse cup works great. Another great place to use baking soda as a dry scrub is in toilets along with your toilet cleaner. Just make sure you put the scrub on the inside walls of the toilet bowl and not in the water, because if its disintegrating, its not helping you scrub! As always, we reccomend checking out EWG before using any cleaning solution. You may not get as excited about a dirty tub as I do, but I hope this helps you get that immaculate transformation. Happy scrubbing! This is a great tip. I love using baking soda. Aside from toilets as you mentioned on the article, baking soda is useful for removing grout from tile and coffee stains. That idea never occurred to me, so thanks for sharing. Hi Daneil, Thanks for visiting! Have a great day! There’s nothing like a sparkling clean tub! Thanks the tips are really useful, using a scrubber that isn’t too abrasive is important. DIY cleaning is the best solution for cleaning your indoor like the bathroom, shower and tiles grout. So you can use right cleaner which you will need.